I have a few goals that I am working on for 2018 and will be using these 2 planners to help me be successful. The one on the left is from Chapters and I love it. I was sold by the cover alone but the inside is perfect too. I actually loved it so much that I bought it as a gift in our secret santa exchange in my mom's group this year. I hope she loves it as much as I do. They are currently on sale at any chapters/indigo location and online if you are still looking for one. Winners also has some too. The one on the right was purchased at Michaels and is a fitness planner. There is a section for yearly goals and ways to meet them at the front and then each week and month has like mini goals and habits you want to work on. You can track your meals and water intake. It is like my fitness pal without the calorie counter and on paper. I am a visual person and do better with seeing things and writing them down rather then just using an app. I hope this helps me to cut back on the starbucks intake. I also have imposed monthly challenges for me. Each month I will have 3 or 4 challenges to do. I haven't decided how I will blog these but they will be spoken about some how or way haha. My first challenge is shown above + is a fitness challenge. I think it should be challenging but not like super hard like a push up or burpee challenge that I have scheduled in the coming months. I should easily be able to get this done when I wake up in the morning or before bed watching tv after the kids go to bed. My second challenge is the minimalist decluttering challenge that I found on pinterest. I think this is a great challenge to start off the new year and decluttering is one of my favorite things. I hate clutter!! This involves getting rid of a lot of stuff we don't need and reorganizing which I also love. I have been trying to figure out to utilize our linen closet upstairs as I feel we don't use it the way we should or could and it bothers me constantly and has bothered me for years!! What do you use your linen closet for? My third challenge for January is the Lululemon Strava 40/80 challenge. Registration is open now and it runs from January 2 - 15th. You have to run either 40k or 80k or both during those 13 days but it has to be outside. When you reach either or both distances you get a badge. Strava won't work on a treadmill since it doesn't activate the gps. If you live basically anywhere from Alberta eastward across Canada then you know the weather that we are having (as I type this, it is -26 without the windchill) has been GROSS!! I hope that as of today it warms up a lot so I can run outside. Although running this week with the kids out of school will be difficult. Either have to go early in the morning or after Greg gets home from work. Wish me luck haha. My last goal for the month and one that I hope will carry out throughout the year. Last year I only officially meditated 17x so hopefully I can outdo that. 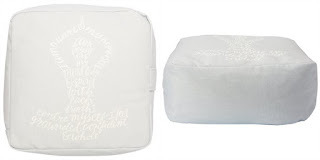 I bought this cute meditation pillow and I can't wait to use it. Although sadly I won't be using this meditation pillow until we are done sanding, priming and painting our main floor because our house is a dusty disaster!! I will be meditating in other spaces though until I can use it.